The bright butterfly dog from the courts of Europe. Papillon means butterfly and Phalène means zo moth. I likes the little dogs for their lively, active personality. Nobody told them they're a small dog and it wouldn't have mattered if they did. Bright and perky, with elegant ears and a royal attitude, the Papillon (butterfly) is a hardy little dog that brightens the darkest day. The Phalène (zo moth), a separate variety of the breed with drops ears, another winged beauty that folds its wings at rest. Phalènes and Papillons can be born in the same litter, but Phalènes are not as popular as their brethren with the upright ears unfortunately. The Papillon and the Phalène have typical spaniel personalities, bright cheerful and accommodating. They are intelligent dogs, quick to learn, and find great joy in human company. The breed standard describes it as a small, friendly, elegant toy dog of fine-boned structure; light dainty, and of lively action. Small it is. Height at the withers a pros 28 cm. Weight is in proportions to height. The 2 weight-classes mentioned in the original French standard is not used in Denmark). 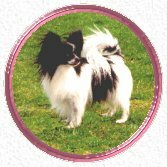 The papillon has a long, silky top coat with no undercoat. The hair is straight, the chest, ears, backs and for legs, and the hind legs above the hocks are fringed. However, as fine as this hair is, it needs little grooming. This big dog in a little package thinks its job is to guard its family's possessions, the dog may bark intensely at each an every sound. The breed also can be sensitive to anesthesia an individual dogs may need their teeth cleaned frequently. Physically healthy, the Papillon and the Phalène is long-lived. Its major health problems include Patellar Luxation (loose kneecaps), some eye problems Progressive Retinal Atrophy (PRA). 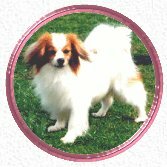 In Denmark do most of the breeders, who are member of the Danish Kennel Club and the Papillon Club in Denmark a big work to breed healthy, typical and beautiful Papillons and Phalènes.